Carl Bonstedt of Germany first developed fuchsia “Gartenmeister Bonstedt” between 1904 and 1906. Downward hanging, salmon to brick red flowers appear in drooping clusters on stiff stems, attracting hummingbirds in huge numbers. The leaves are reddish bronze topside and purplish beneath. In the Calgary area this plant does best when placed in a container on the patio in filtered light. Sun from 6:00am until 12:00pm is all that is needed for continuous blooms all summer. 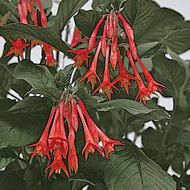 Growing to about 3 feet tall, this Fuchsia is stately, attracts a large amount of attention and mixes well with Ferns, Bacopa, and Ivies. There is always a debate over what to choose for Katrina’s Picks, but this was an easy choice. Nicotiana sylvestris is a species of wild tobacco native to South America. The common name is “Only The Lonely”, as you only need several to fill a large space. These plants are big, growing 5 to 7 feet tall! With a root system strong enough to support the thick stems, the plants happily lean out of the borders at crazy angles. Flowers are tubular, white, and appear in large clusters above the foliage. Each flower may grow to be over 7 inches long with a 2 inch wide face at the bottom of the flower, like a swirling skirt. They may appear a bit sparse when first planted, and even Katrina has been fooled into planting several more than needed. Thus, when first planting small seedlings, place them about 10 inches apart. Nicotiana grows best at the back of the border, loves a dappled light to part sun exposure and comes into to its own in August. A real WOW plant. Here at Vale’s Greenhouse we often sell three or more types of Guara, ranging from white to intense pink. 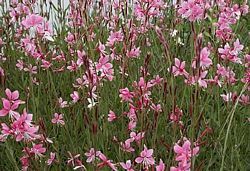 Not commonly used in containers, we think Gaura will add a little dash of panache, creating an exotic, cutting edge and sophicated look to combination container planting. “What does this mean, has Katrina gone all pink and girly?” No, it is the foliage that Katrina likes. The narrow leaves range from mottled green to maroon, depending upon the variety you choose. Gaura is graced by colourful flowers resembling butterflies gathered around a tangle of airy stems and branches that sway in the breeze. For the 2010 season we are selling the varities Cherry Brandy Pink, Karalee Petite Pink Innocence and Crimson Butterfly. So why do we love this plant? Because it is blue, blue, blue. Not purple, not lavender, but blue! Blue Angel is perfect in containers planted by both the connoisseur, who will rave on about it, or the person who just knows a good thing when they see it. Undeniably a most desirable plant with gorgeous, large, blue (Did I mention that?) hooded blooms that appear in early June and continue until frost. This plant is happiest in a container in full sun and should be deadheaded to promote new blooms. Perfectly content on its own or in the mixed container, these wind resistant bushy plants with their hairy, dark green leaves will become your container favourite. As indicated time and time again when choosing Katrina’s Picks, the grass selection is a popular choice. So, for the 2010 season we have chosen an Acorus. Acorus is not technically a grass, but a member of the rush family. 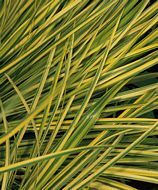 “Ogon” is a dwarf cultivar (about 12 inches) of grassy-leaved, glossy, pale green and cream-striped leaves with an overall golden effect. The showy foliage is perfect for mixing into the part sun container. Fan shaped leaves fold over the containers edge gracefully. Acorus Ogon will brighten up any dark corner but will turn lime green without enough sun (however lime green is a good colour). This plant will tolerate deep shade if you are willing to let the colour fade. Ideally “Ogon” would love to be planted out of the heat of the day.